HOW would you like to own a Porsche that lets you accelerate silently and quickly up to 135km/h with 70kw of power? Better still, would you not like it better because it sprints from — with the combined powers of a combustion engine and an electric motor — 0 to 100kph in 5.5 seconds and moves at a top speed of 270kph, effortlessly? It sips petrol too. Got your attention? Driving a Porsche slowly has never felt more rewarding along city roads and even the countryside. These were the 200km of roads where we drove the Panamera S E-Hybrid in Singapore recently. I must say there’s a certain sophistication to the way the Panamera S E-Hybrid sips petrol occasionally. At the end of the day, we were left wishing for its PHEV (plug-in hybrid electric vehicle) technology to spread into everyday cars. I think PHEV technology is definitely the next big thing in cars. The Panamera S E-Hybrid’s batteries were charged up over a long lunch (two hours) at the electric charge station on Sentosa island. Yes, you may also charge it over four hours in your 3-pin plug socket at home. Overall, our impression of the Panamera S E-Hybrid was positive. After all, it has been calculated that at 5.7L/100km, the Panamera S E-Hybrid’s 80-litre tank would have lasted us 1,400km — 28 days before refuelling. And yes the electric motor delivers its maximum torque immediately as the car drives off from a standstill with a powerful acceleration that is nearly noise-free. For starters the Panamera S E-Hybrid offers four driving modes that can be selected by three push buttons on the centre console. The E-Power mode enables largely all-electric driving. When E-Power is deactivated, the operating strategy switches to Hybrid mode. This essentially freezes the momentary charge state of the high-voltage battery to conserve the electric driving range for the next stage through a city. The E-Charge mode can be used to efficiently charge the high-voltage battery during the drive. 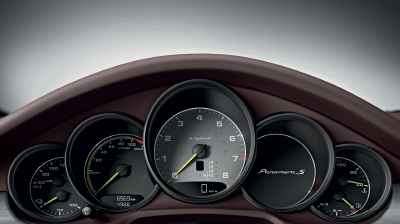 Rounding out the driver’s options is the Sport mode for a typical Porsche high performance and a special sporty characteristic with more direct handling. The E-Power mode is activated by default, so that every driving trip can be started electrically — provided that the battery charge state is sufficient. The basic prerequisite for the efficient use of the E-Power mode is regular external charging of the high-voltage battery, such as overnight in a home garage or at the workplace. When the E-Power button is deactivated, the Panamera S E-Hybrid is driven in Hybrid mode. This operating strategy — programmed for efficiency — fully automatically switches between the driving states of electric driving, hybrid driving with load point shift, coasting, electrical system recuperation and boosting. The electric drive produces 95bhp (brake horsepower or 70kw, which is over twice the power of the previous model’s electric motor at 47bhp. It draws its energy from a newly developed lithium-ion battery, which at 9.4kw has over five times the 1.7kw energy capacity of the previous nickel metal hydride battery. Combined with the supercharged V6 motor, which produces 333bhp, the Panamera S E-Hybrid attains a system power of 416bhp. This positions the plug-in hybrid on the same power level as a V8 engine. As in the previous model, the brake system of the new Panamera S E-Hybrid enables recovery of braking energy; this energy that would otherwise be lost is stored as electricity in the high-voltage battery. The generator function of the electric motor might be activated first, absorbing up to the maximum possible load, then the conventional brake would be superimposed, depending on how hard the driver presses the brake pedal. This battery regeneration map differs from that of the previous model; it was adapted to the new electric motor that is more powerful, and it was further optimised for driveability and pedal feel. Electrification of auxiliary systems such as climate control enables an especially comfortable option in the plug-in hybrid: auxiliary climate control. At higher outdoor temperatures, an electrically-driven air conditioning compressor is used, while at low temperatures a high-voltage auxiliary heater generates 5kw of heating power. Inside the car, the rear passengers experience a comfortable ambience all around. The larger interior space was achieved by increasing the reclining angle of the rear backrests for more relaxed sitting, and by a 12cm longer foot area that offers more leg room. The standard comfort seats at the rear with comfort head restraints are individually adjustable. Along with electric four-way lumbar support, they feature both an electric backrest adjustment and electric longitudinal seat adjustment. Here’s the main course. One of the core competencies of the Porsche is boosting performance and efficiency. In developing the new Panamera, this competency led to an entirely new engine based on the downsizing concept: a V6 engine with three litres displacement and biturbo charging. The V6 biturbo replaces the previous 4.8-litre V8 engine in the Panamera S and Panamera 4S, and it is also used in the new Executive version of the Panamera 4S. Its basic parameters are themselves indicators of progress: 20bhp more power and 20 Newton metres (Nm) more torque, with up to 18% better fuel economy compared to the V8 engine in the previous model. So, the driver not only gets a more powerful and efficient engine; turbocharging results in a maximum torque of 520Nm over a very wide range of engine speeds for a superior and uniform performance curve, even at low revs. The free-revving biturbo engine also expresses its sporty-emotional side acoustically. 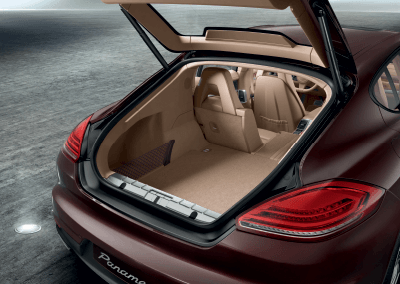 As in the Panamera GTS, induction air sounds are transmitted to the interior via a diaphragm. An acoustic channel also acquires the induction vibrations between the throttle valve and the air filter. A membrane integrated in the acoustic channel transmits the vibrations to the A-pillar as engine sound. A control flap upstream of the diaphragm is used to activate or deactivate this sound symposer when the Sport button is pressed. The tailpipe sound of the exhaust system can also emotionalise the acoustics by pressing the Sport button. When it is activated, an exhaust flap increases the size of the opening, and this results in an audible sound that is very sonorous. My verdict after the day’s driving in Singapore? The all-new Porsche Panamera S E-Hybrid is pure sorcery. It would seem like Porsche has applied some kind of technological witchery to a battery-equipped Panamera to create a conscience-salving petrol sipping super-saloon. The Panamera’s hybrid credentials also means there’s a whole host of other regenerative factors that charge up the battery, like under braking, high-speed unrestricted highway-style cruising, driving with just the petrol engine running, and so on. If you haven’t driven one before (yes, I am rubbing it in), there’s a little “resistance” built into the accelerator pedal — pushing past this point unleashes the total electric motor/supercharged 3.0-litre V6 combo for maximum acceleration. Downsides? The additional bulk has a slightly detrimental effect on the Panamera’s agility. And the brake pedal is soft and long, but not very strong. Is the Panamera a pretty car? No. Handsome? Maybe, if seen from the right angle. But is it really any more disturbing to the eye than a big BMW, Mercedes or Audi? I don’t think so. Sime Darby Auto Performance Sdn Bhd Porsche Malaysia will make the Panamera S E-Hybrid available in Malaysia based on orders. This article first appeared in The Edge Financial Daily, on March 16, 2015.